Liz's Paper Loft: My Creative Time ~ September Sneak Peeks Day 1! Hello Paper Lovers! Today is the first of two sneak peak days showcasing My Creative Time's September Release! This set that we showing today is perfect to get all your Christmas food gifts planned! Now just because I said Christmas, don't think that's all their good for! For today's project I made a cookie bag. I realize it's hard to see in the picture, however I embossed the bag with a "wood grain" folder. This took me no time at all! You most certainly could make a ton of these in a short amount of time! You see this Christmas, I'm going to be all about "cute & quick" so I can spending more time with loved ones! With Emma's dies, stamps, and my cricut, I will be able to accomplish that! Emma will randomly pick & announce all winners on Friday, September 21st during the blog hop release happening @ 12:01am PST in her video! GOOD LUCK! Be sure to head over to Emma's to see what half the design team made today! I can hardly wait till tomorrow to see what the rest of the kids made! Great cookie bag. I love the way you attached the label. I LOVE this Liz!! What a GREAT treat idea!! The paper is beautiful and loving the sneak of the new stamps!! Hello Liz, this is so simple and so so cute. Love it! Thanks for sharing. This is the perfect treat bag, Liz! Absolutely adorable! How clever to emboss the bag - I love that!!! Just not enough time to create all the things I want to do but it sure is fun. Just love to craft. Love your products. What a cute treat bag! The cookies look yummy too! Have an awesome day! I love those stamps and your treat is beautiful. Liz ~ Oh WOW! LOVE what you did with that glassine bag! I can TOTALLY see the woodgrain! LOVE it! Okay that tag wrapped around with Emma's dies ~ Oh I really like that look! I am going to have to try this plus LOVE that paper! Well I see no recipe for those YUMMY cookie! Hmmm! Well like always LOVE your creations!!!! Super cute! These would make wonderful gifts. Very cute bag! I like the look of the embossed bag. I love seeing your embellishments all over people's creations. Very creative to emboss the bag. Perfect with this stamp set. I just love the embossing you did, the tag is so cute. Thanks for sharing. scream Christmas! Also, cute idea to emboss the bag! Cute and quick - great philosophy! Love how you used the button on your tag. I am all about the quick and cute too and I think this is super cute!! Love that you embossed the bag. Can't wait to see what is in store for tomorrow!! Very yummy idea!! I love cute and fast and you are so right about the dies making it easy!! Just gorgeous! Love your embossed cookie bag! Such a cute treat bag...Love it!!! What a neat idea Liz!! TFS, have a lovely day! Very cute--I like the wood grain embossing. Liz, great idea on the gift bag and I agree, this will be a wonderful set for gift giving. So elegant looking and yummy too! wow very simple and so pretty!! These are so easy to mass produce for teacher gifts! 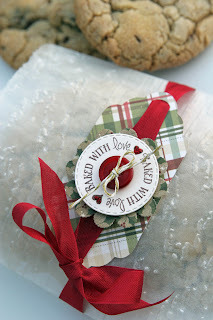 I love the idea of embossing the bag and that plaid paper just screams Christmas. Super Duper Cute. I love your tag with the ribbon through it and all the wonderful circular sentiments I've been seeing! Thanks so much for sharing!!! This is so cute. Love the paper and the twine. The cookies look good too. Sweet this cookie bag. The best part is when you ate this yummy cookies. Thanks for share with us. Great cookie bags. Who wouldn't love getting a cookie in such a pretty bag? Thanks for sharing. Yummy! And Super cute!!!!! What a fun office gift idea!! What a perfect tag. Sooooo cute! Love the idea of embossing the glassine bags. 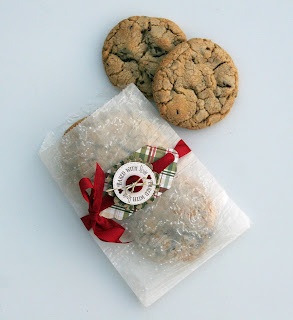 Cookies look delicious and the wrapping is so awesome! Emma's new stamps will be a hit this year...they look great. Wonderful job on your cookie bag...it looks beautiful and yummy I bet! Your cookie bag is beautiful and the cookies look yummy!! Oh my gosh, I LOVE what you did with the glassine bag! the wood grain looks awesome! 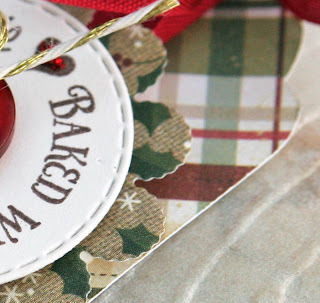 The tag, the ribbon, the die....It all looks so perfect! Hope you have a SUEPR day! Such a cute treat bag with such yummy cookies. What a cute way to decorate a treat beg. Love the wood grain embossing on the the bag. The tag is darling! Love the way you attached it to the bag! Thanks for sharing your cute bags. 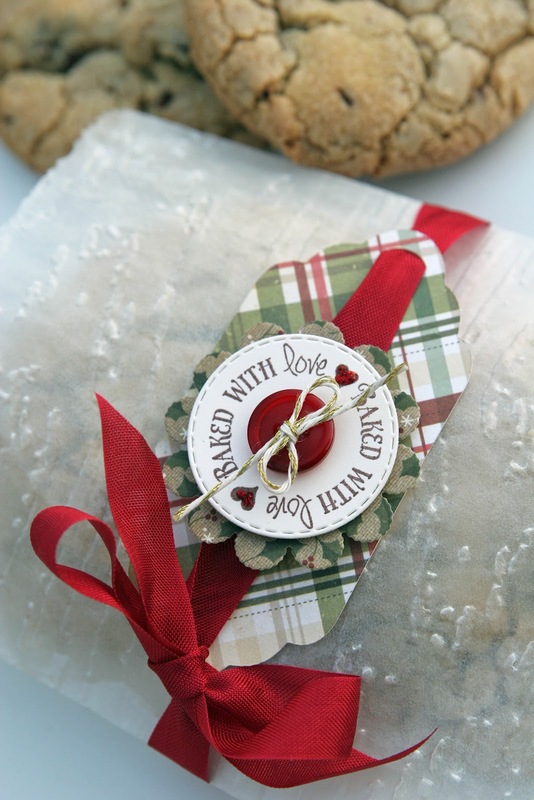 Such an elegant way to give cookies!! I love the beautiful tag and ribbon you have added to the bags. Fab use of Miss Emma's newest sets!! Cute way to wrap up the cookies.